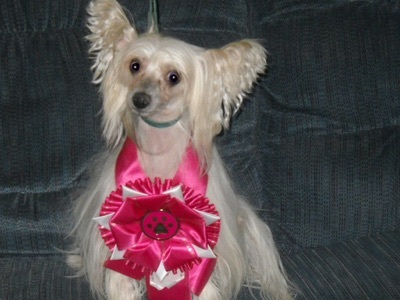 Gingery’s Kaydee was a wonderful little Chinese Crested. Kaydee came from New York City to join the crazy Border Collies in the McGuire family. We knew that she would work well in the family when we went to pick her up and she was playing with 2 Pit Bulls like she was their size. 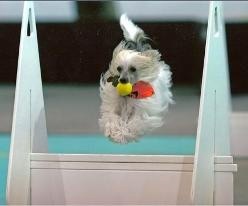 She started training in Flyball as a puppy. No one (except Lauralee) believed that she would ever compete in the lanes since she had a very hard time learning to catch a ball. However, she finally found a box that was gentle and she earned her FD a day after her 5th birthday in October of 2006. 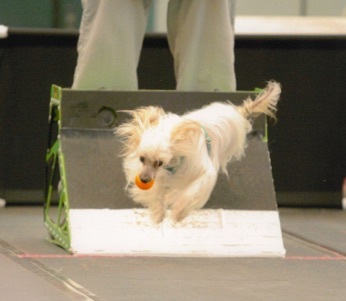 Amazingly enough, she has earned her Flyball Master Champion since that exciting first title. At home, Kaydee loved to keep all the Borders in line. She also loved to steal food from Branden when he forgot and left his food unattended. 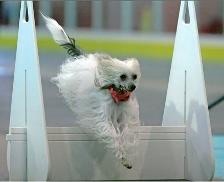 is NAFA’s 3rd Highest Pointed Chinese Crested. Her littermate Gingery’s Guinness is the first Crested to earn his FGDCh-30K. Kaydee has retired from flyball after earning her FGDCh-30K. Kaydee left us at 14 years old and will be missed by many.